Action Steps to Start Your Home Staging Business Not "Homework"
1. Unlike many companies offering home staging training, I tell you up front that there is no such thing as “official credentials” to become a home stager. 2. The Staging Diva Program is about the business of home staging. Consistent with my goal of teaching you how to start and grow a successful home staging business, I have created Action Steps for each of the 5 Staging Diva Courses. In other words, each assignment is designed to move you closer to your goal of having a successful home staging business. 3. Whether you complete the Action Steps or not is completely up to you. The assignments I suggest are Action Steps you need to take to get your staging business off on the right foot. I assume if you’ve ordered the Staging Diva Training Program, it’s because you want to learn what I have to teach you. If you take these Action Steps, you’ll be more successful in your home staging business. You do not need to submit any homework or photos to complete the Staging Diva Training Program. There are no marks, and there is no pass/fail. If you order the complete program, you will automatically get a Staging Diva Graduate Certificate in the mail, personalized with your own name and the date you ordered the program. 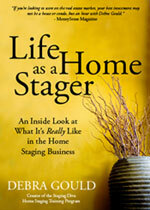 Staging Diva is one of the most respected names in the home staging industry. I could claim to be the “world leader” as many of my competitors do, but how do they know that’s the case? I have students in 21 countries compared to their 9, but I still wouldn’t make such a bold and unsubstantiated claim. When you’re ready for substance over hype, check out the only home staging training program created by someone with an MBA in Marketing and years of personal experience growing a successful home staging business! Staging Diva Graduates receive free artwork to use on their websites and in their marketing materials. Grad badges come in 2 styles and 4 sizes.